GREAT NEWS! 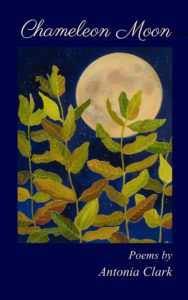 I’ve secured a reversion of rights to my poetry collection, Chameleon Moon, and the book has been reissued by Bellevue Books (February 2019). The paperback edition is now priced at $6.99 and the digital at $3.99, but, through Amazon’s MatchBook program. . . .
My first full-length poetry collection, Chameleon Moon, was published by David Robert Books in 2014. That edition is now out of print. learns that she’s always been insatiable. Turn anywhere, and then keep going. The gorgeous cover art is the painting “Moondance” by Michigan artist, Lauren Everett Finn. metal drums, smoldering tires at Ratty’s junkyard. along baseboards or leapt from kitchen cupboards. Wind scurried ashes along the streets and gutters. And the chameleon moon blinked its liquid eye. and turned away at the touch of burning flesh. Oh I can’t wait to read the whole collection! I love what I have read so far in the author’s preview. The poems are visceral, emotional, descriptive, elusive enough for the reader to interpret in personal ways…like a chameleon moon. I am excited about getting my copy of Chameleon Moon. I have “Smoke and Mirrors” and have read it over and over. Toni’s poetry is a beautiful intermix of gorgeous phrasing, intelligence and insight; funny, at times, in penetrating ways. Her poems are a direct hit to your heart and mind; reading them over often unveils some new glimmer into a nuance you didn’t catch while at the same time, being poetry that is accessible upon a first read. This is exciting. Oh, and, love the cover.